For over 100 years, the law of attraction has been recognized as a concept of turning thought into energy, vibration and manifestation. This may seem odd as this feat has been available to all mankind since the beginning of the universe. For Western civilization to finally put a name with a face is not unusual. Look how long it took us to discover DNA. The law of attraction is simply the ability to attract certain things into you life with your thoughts. Many dismiss this universal law as a false reality because it does not work for them. This is where intent comes into play. You cannot desire a big car or a big house and expect it to magically appear. These are mental and egotistical desires, not the real make-up of your soul. The law of attraction cannot turn you into a different person, but can only expand on what your primary nature consists of. If you think that money will solve every problem that comes along, you have no intent. Everyone has a place in the world and figuring out where you belong is the first step to utilizing the law of attraction. It may take months of meditation to determine what is truly in your soul. 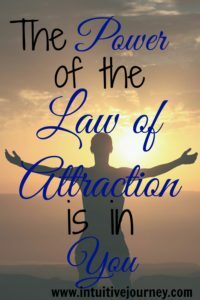 Only then can you begin to focus on attracting fulfillment with this universal law. What do you feel truly connected to? Nature, health and love are topics which may seem larger than the world, and they are. But these are things that radiate inside all of us and can be the basis of your specific attraction. Concentrate on your inner joys and interests. If you are good with helping others and find this type of work very self-satisfying, this could be a good start. Good vibrations and a positive attitude are necessary to attract your desires. On the other hand, if you work in an office where you crunch numbers only to receive a payroll check, you are probably attracting negativity. The law of attraction begins with you. Take the steps to fulfill your dreams and use the power of the universe to further your purpose and happiness in life.